Learning how to charge a car battery is important for every car owner. As long as you maintain your car battery, it can last a long time and will maintain a charge throughout its life. 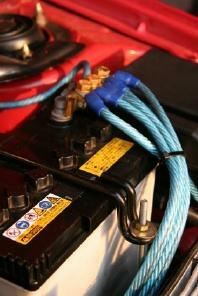 There are three methods for charging a car battery. Each one is safe to use on most vehicles. However, each one does require safety precautions. If you do not take a few safety precautions before you attempt to charge the car battery, you could risk injury from explosion. Ensure that the car is in park and that everything within the vehicle is turned off, including the air conditioning, radio, headlights, and turn signals. Unplug any accessories, including cigarette lighters. This reduces the risk of a spark that could cause an explosion. If there is anything leaking from the battery, stop. You cannot charge the battery. You will need to replace it instead. If there is corrosion around the dead battery terminals, you'll need to clean them up. All wires need to be tightened. Doing this will ensure a good charge occurs. Note that in most cases, the positive battery cable is red or orange in color, and the negative cable is black. However, you should confirm this in your owner's manual prior to starting any type of charging process. The first way to charge the battery of a car is simply to keep it moving. A vehicle will recharge the batter whenever the engine is running. The vehicle has an alternator that produces an electrical pulse and allows the car to store power in the battery. The vehicle creates that electricity any time that it is running. If the vehicle dies while running, this may not be because of the battery charge. Instead, it may mean that the alternator is not producing electricity. Once you get the vehicle running, drive it for at least 30 minutes. This will charge the battery in the vehicle significantly. If the battery was dead, conserve electricity while you are driving the vehicle by keeping the radio off and not using the lights. Perhaps the most common problem with car batteries occurs while the car sits for an extended time. If the car is not running and will not start because the battery is dead, you can jump start it. Follow these steps to jump start your vehicle after following each of the safety precautions above. Position a fully charged car right next to your vehicle so you can attach jumper cables. Turn off the ignition on both vehicles. The cars cannot be touching. Position the red clamp (or positive clamp) of the jumper cables on the positive terminal of the dead vehicle. Position the red clamp onto the positive terminal of the vehicle that runs. Clamp the black clamp (or negative clamp) on the negative terminal of the working car. Position the last clamp, a negative black cable, on an unpainted metal surface in the dead car. This will ground the charge. Start the working vehicle and wait about ten minutes for the dead car battery to charge. Attempt to start the dead car. Once it starts, remove the cables following the exact opposite order you put them on. Let the car run for five to ten more minutes to charge. Another method for charging a car battery is with the use of an automotive battery charger. These units plug into a household outlet and charge the car battery. However, you need to remove the battery from the vehicle for this to work. This does give you a quick charge, but it can be one of the most effective ways to charge your vehicle.To use this method, purchase or rent an automotive battery charger. Then follow the directions provided by the manufacturer for the safe use of the battery charger. No matter which method you use, you'll be glad you know how to charge a car battery. You never know when you'll be left with a car that refuses to start, and a little knowledge can take some of the unpleasantness out of this situation.